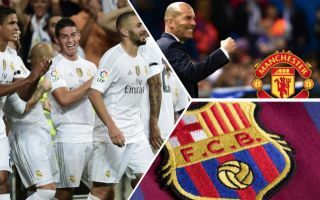 Zinedine Zidane could be about to hand his old club’s rivals Barcelona a big transfer boost should he end up as manager of Man United. According to Don Balon, Zidane has been touted to take over from Jose Mourinho at Old Trafford, and that the Frenchman could manage to bring Real Madrid midfielder James Rodriguez to the club with him should he arrive at United. The report also notes that Rodriguez going to United could see Paul Pogba’s exit from the club be ‘accelerated’, and that the Frenchman has wanted to depart Old Trafford for a while. This could, in turn, hand Barcelona a big transfer boost, as according to Don Balon, the Blaugrana are keen to bring the Frenchman to the Nou Camp, so Rodriguez arriving at Old Trafford could the boost Barca need to sign the midfielder. Barca are hardly crying out for any more midfielders in their squad following the business they did this summer, as Ernesto Valverde’s side managed to bring in players like Arthur Melo and Arturo Vidal, as well as keep hold of Ivan Rakitic. James Rodriguez, who joined Bayern Munich on a two-year loan deal back in the summer of 2017 as per the BBC, definitely has what it takes to be the creative spark in Man United’s midfield, and losing Pogba wouldn’t be as big a blow as it would be if the club sign the Colombian. Barca would be hoping that Zidane brings Rodriguez to United with him should he replace Mourinho at Old Trafford, as that move could be their ticket to finally signing Pogba.